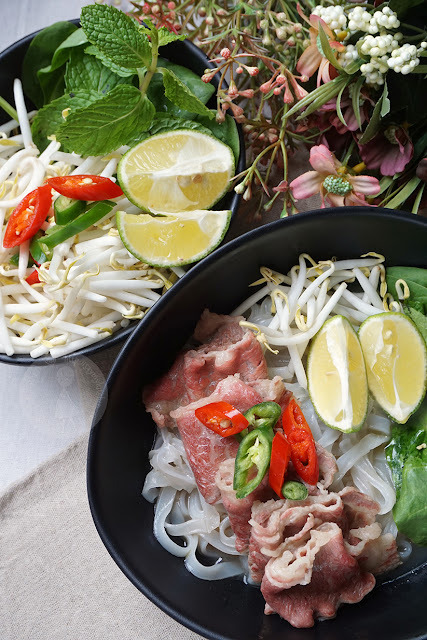 After that experience, we still enjoy our Vietnamese Beef Pho in Singapore restaurants, but not quite the same anymore. The beef stock here is usually more diluted and the fragrance of the dissolved bone marrow not quite eminent. 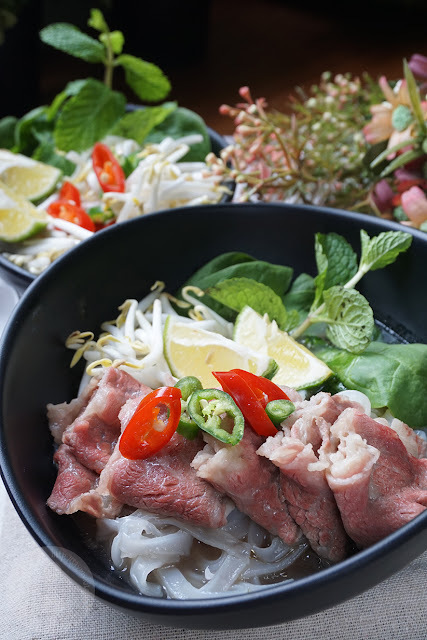 As we know, there are 3 essential characteristics in Vietnamese Beef Pho 越南牛肉粉 - the broth/stock, the rice noodles and the herbs. In my humble opinion, the broth/stock should be of utmost importance of the 3. 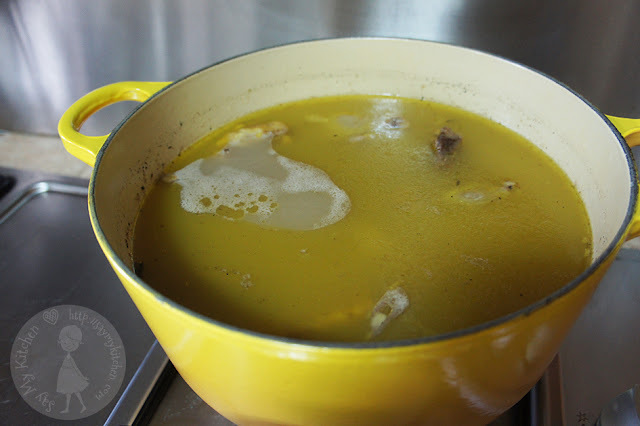 I understand that there are 2 important elements to extract the goodness into the beef bones stock/broth. First being the layering of flavours. 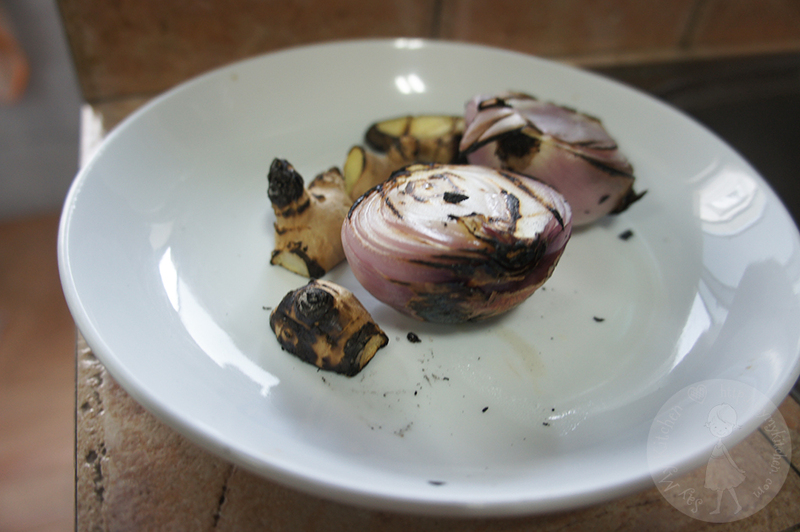 This can be done by roasting or grilling the onions and ginger prior to cooking. This process would allow the caramelisation of the onions and together with other spices, could build layers of flavours in the stock/broth. 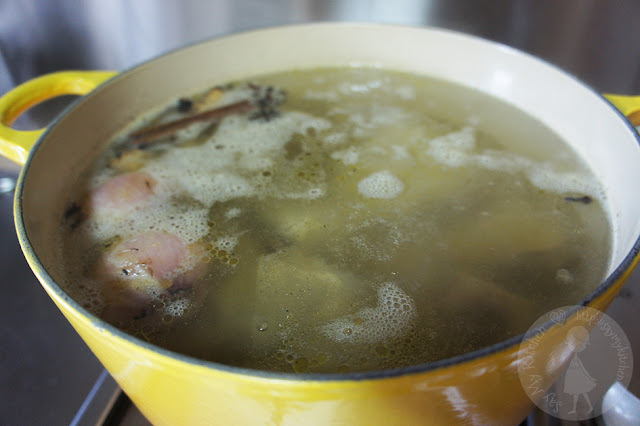 The second important element lies in the amount of time used to simmer the stock/broth. 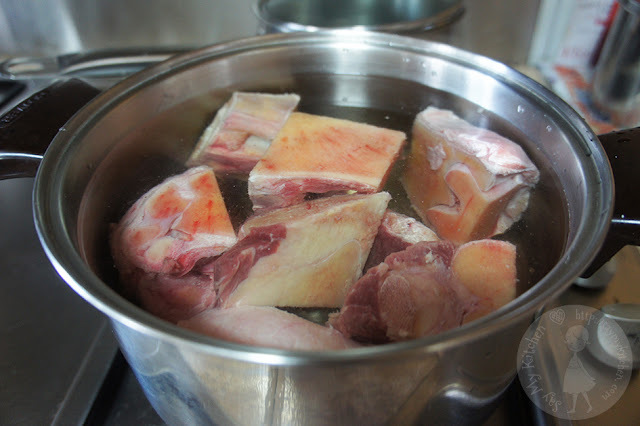 The simmering can only be done in very low heat to extract and dissolve the bone marrows from the beef bones. Hence, the minimum simmering time has to be 5 hours or more. 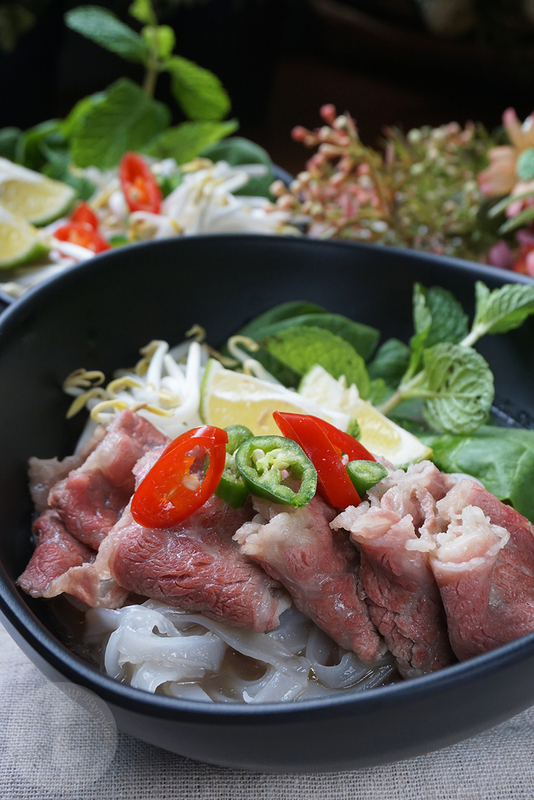 It is said that the better restaurants use minimum 12 hours to simmer their stock/broth for Vietnamese Beef Pho 越南牛肉粉. 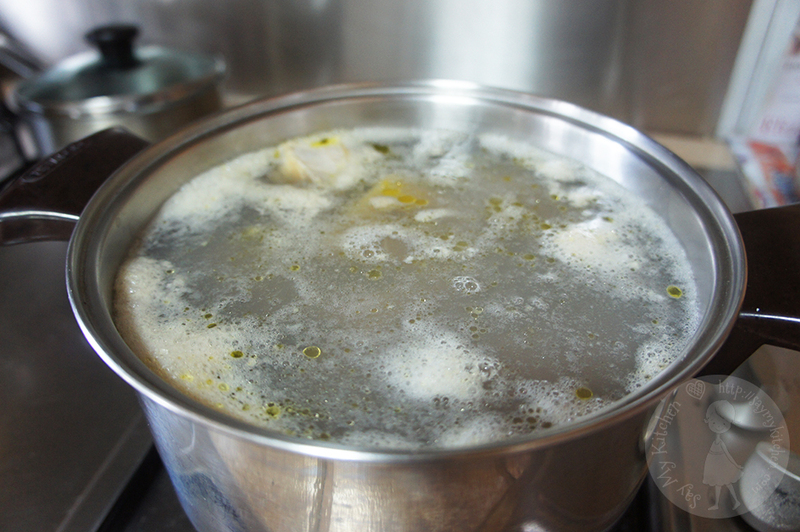 There are no strict rules to follow, just how rich and thick we prefer our beef bones stock/broth. Simmer beef bones and beef chunks in a pot of water at low-medium heat. 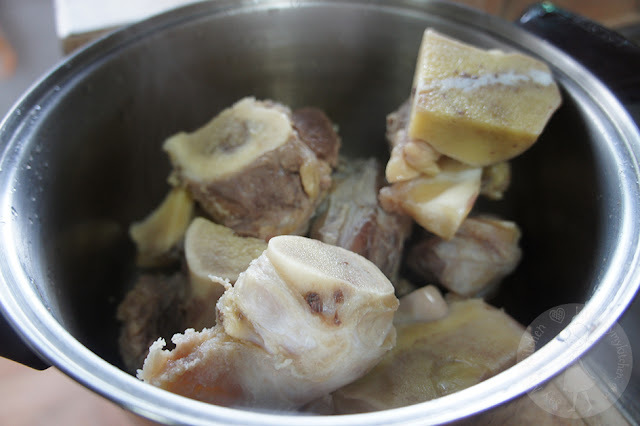 Can put beef bones and chunks/oxtail in pot since onset. Allow to boil. Upon boiling, further simmer for another 5 minutes before turning off heat. You would see scums floating in the pot. Pour scums and boiled water away. 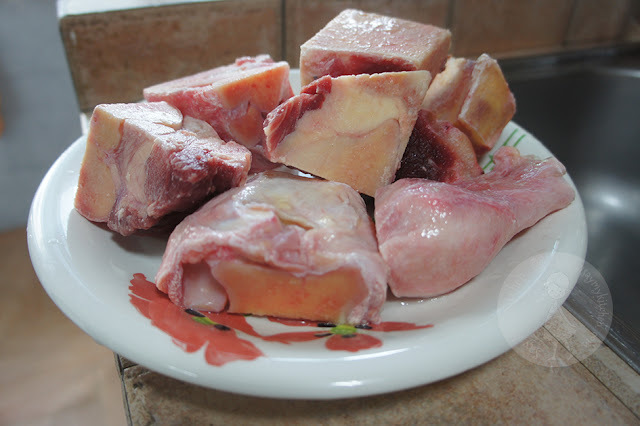 Rinse and clean all the beef bones and chunks till clean. This would allow impurities to be removed and resulting in clearer soup. Grill onions and gingers over open fire at gas burner or broil in oven for 30 minutes at high heat till charred on all sides. 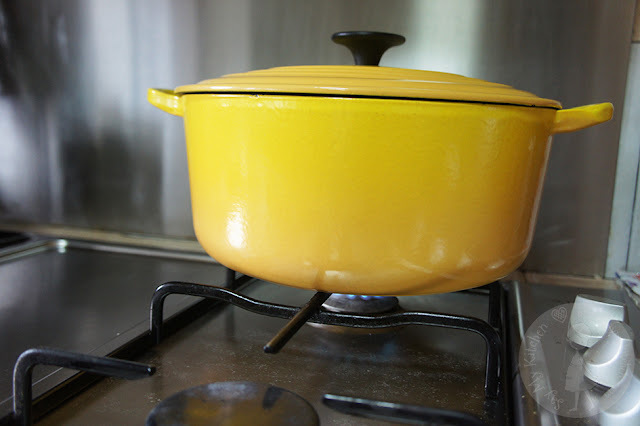 Heat soup pot with a little cooking oil. Fold in beef bones, beef chunks, charred onions and ginger into pot and toss to brown them a little in the heat. Add all the spices (i.e. star anise, cloves, cinnamon stick, coriander powder, fennel powder) into pot. Add 3 litre water into soup pot and bring to boil. Turn to very low heat upon boiling point. Cover lid and allow to simmer in very low heat for minimum 5 hours (I did almost 12 hours) until beef stock becomes rich, thick and fragrant. Top up water as and when necessary. 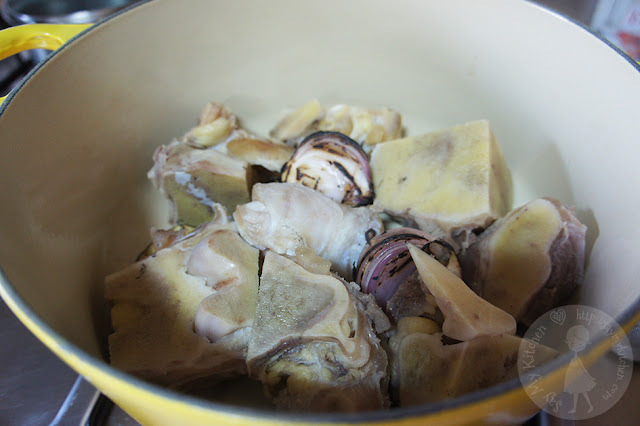 The bone marrow would be dissolved and infused into the stock/broth through slow and low heat simmering. This cannot be achieved with high heat boiling. Be patient. When time's up, taste test to satisfaction by adding seasonings such as beef stock cube, salt and fish sauce. Do note that the beef stock would only be rich with fragrance and flavours but not tasty before you add the seasonings. Adjust taste by adding seasonings to taste. Allow to simmer for further 15 minutes. When beef stock/broth is ready to your satisfaction, skim fats off surface of stock/broth. 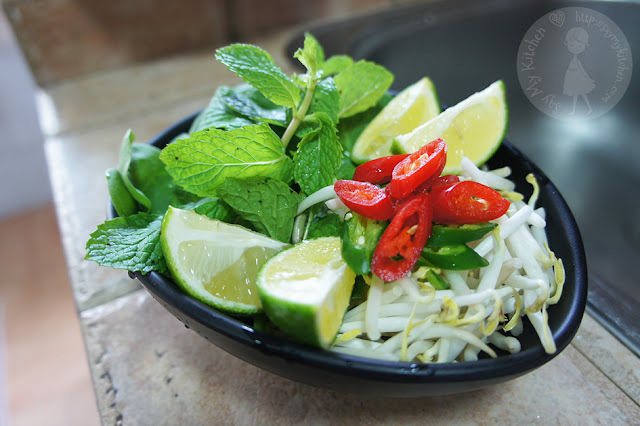 Prepare to cook rice noodles in a separate pot. 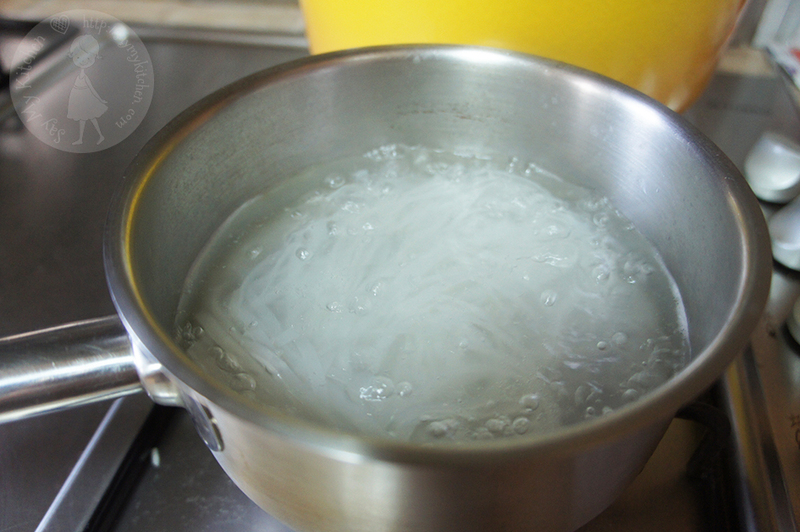 Boil water in separate pot and cook rice noodles in accordance to the package directions. To serve, place cooked rice noodles into individual serving bowls. 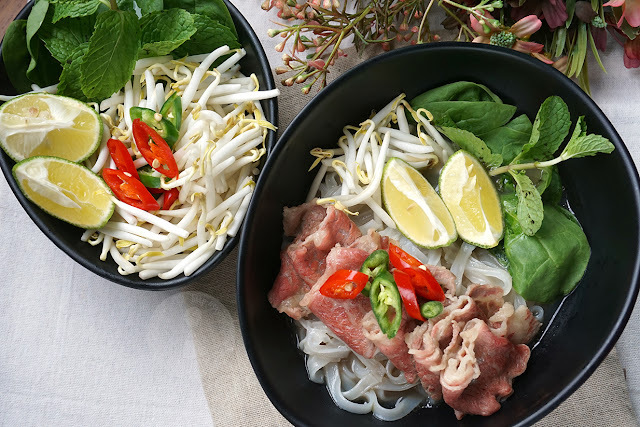 Top it with thin raw beef slices, bean sprouts and herbs. Then use a ladle to pour hot beef stock/broth over the ingredients in the bowls. This should scald cook the beef for consumption with the pho. Serve hot Beef Pho immediately with an accompanied bowl/plate of bean sprouts, lime wedges, cut chilli etc. 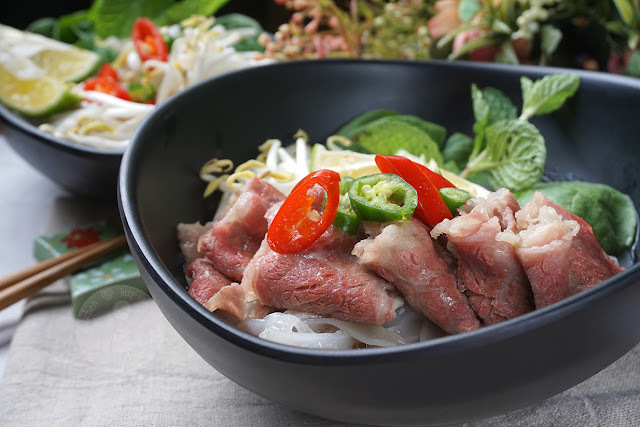 Seriously, it is not difficult to cook Vietnamese Beef Pho 越南牛肉粉 at home. It just require our patience and time. 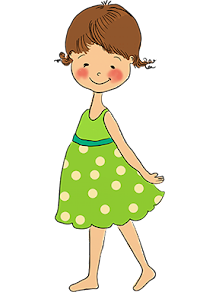 And surely a worthwhile weekend treat for the family!